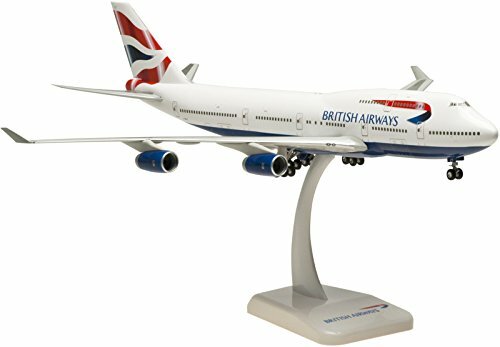 These very collectible, snap-together models are highly detailed and feature superior graphics. Engines actually spin and each plane comes with a logo stand. Landing gear is included with each model. Aircraft can be displayed with or without landing gear. No gluing or painting required. All Hogan models are 1:200 scale. Model is approximately 14 inches long with 11 3/4 inch wingspan. This model is not a toy, it is made of plastic and requires some basic assembly. Snap fit, no need for glue or paints. 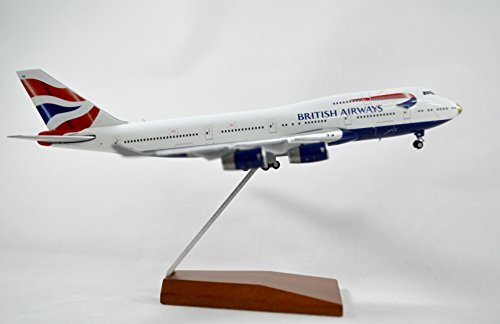 This is the type of model displayed at travel agencies, airline offices and/or sold in airport gift shops. Perfect for the Civil Aviation aficionado. 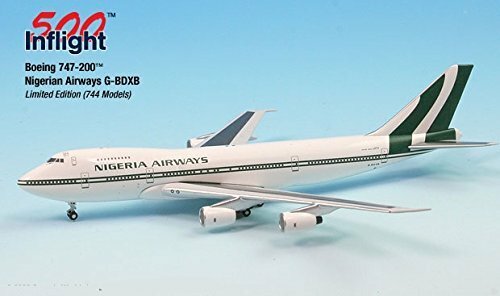 This model represents the Nigerian Airways 747-200 G-BDXB as it appeared in 2000 when it was on lease from British Airways. Model released May 2007 with 744 pieces pieces produced. 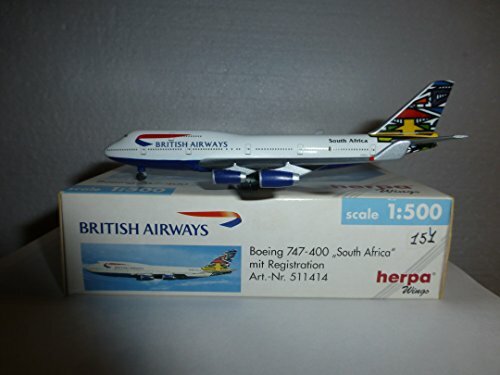 British Airways plc (LSE: BAY) is an airline of the United Kingdom. 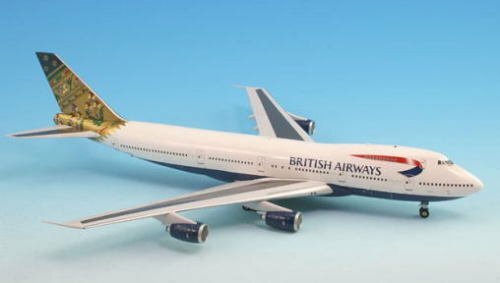 The airline has the largest fleet of aircraft of any British airline, but is only second in terms of international passengers carried. Its main hubs are London Heathrow and London Gatwick. Flight Miniatures models are produced in a high-gloss plastic accurately painted and professionally detailed with a unique push-fit style of assembly. They require no painting or glue; just gentle pressure to snap on the wings, tail and stand. All models come with their own stand. Most stands are personalized by airline. In less than a minute, you have a finished airplane model to enjoy for many years. These Snap-Fit models are the same ones you see on display at museums throughout the country. 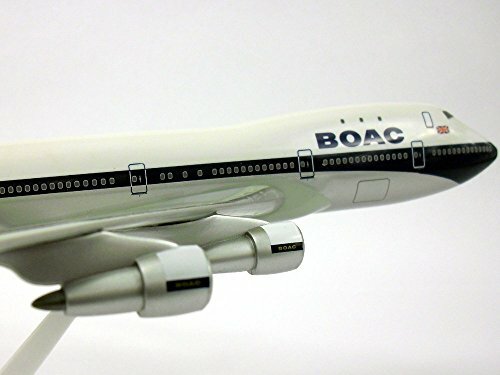 Gemini's 1:200 scale Boeing 747 is an exceptionally large and heavy model in this scale (over two pounds) and is constructed almost entirely of solid diecast metal. The extra wide-body fuselage, with its wonderfully sculpted nose section, features all around seamless construction with pad-printed windows and doors. The model is supported on an all metal fixed landing gear with soft rubber tires and a steerable nose wheel. The solid metal wings are constructed as a single unit, and then carefully fitted to the fuselage. They feature accurately replicated flap track fairings at the rear and free spinning highly detailed fan blades inside each engine nacelles. 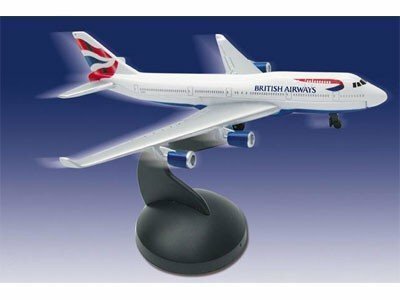 Welcome to the exciting world of Inflight Models! 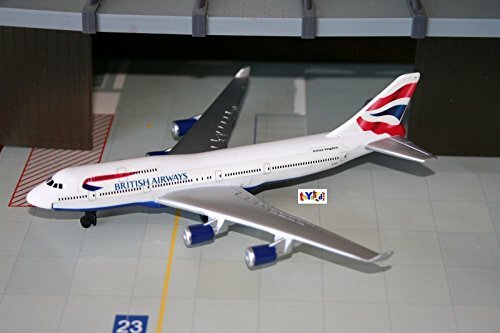 These, 1:200 scale diecast jet replicas; represent the world's airlines both past & present. 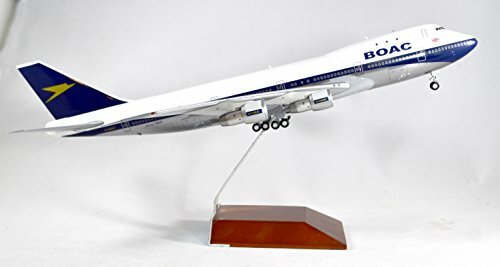 Each model is highly collectible Die-cast Aircraft All Metal Limited production The model measures approximately 13.75" long x 11.72" wingspan.